Readers of STH will know I am personally a big fan of Proxmox VE. 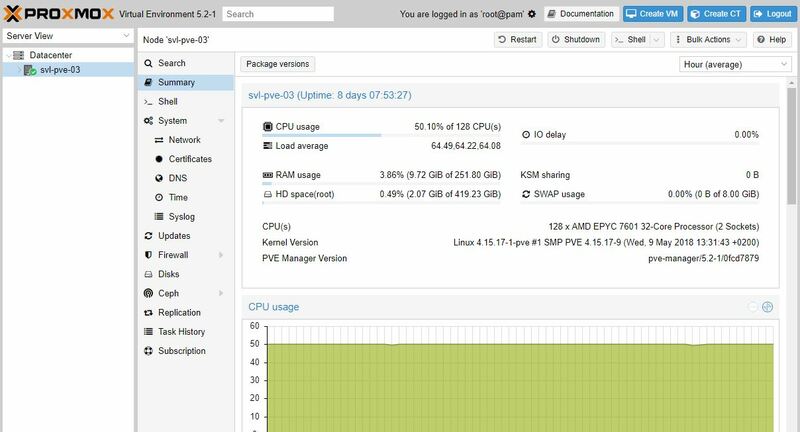 For those who have never heard of the solution, the quick summary is that it is a hyper-converged virtualization and container platform built on Debian Linux. The solution has easy cluster management and storage features ranging from ZFS, GlusterFS, and Ceph. Although the solution does not support Docker out of the box, you can see our guide Create the Ultimate Virtualization and Container Setup (KVM, LXC, Docker) with Management GUIs to get that working. One question we have been getting from readers is how well does AMD EPYC work with Proxmox VE. Recently we ran a piece Proxmox VE 5.2 Released with cloud-init and LE certificates. 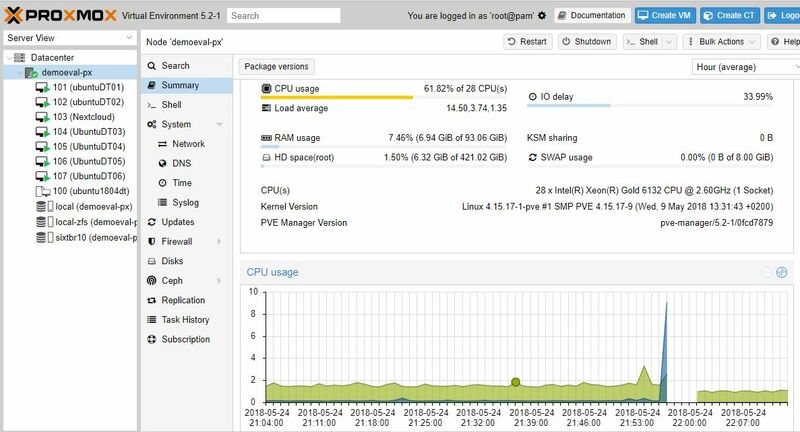 The newest Proxmox VE 5.2 version is built on Debian 9.4 and incorporates the Linux 4.15 kernel along with a host of nice features. As a result, we started getting questions about AMD EPYC 7000 series CPUs with Proxmox VE. We tested Proxmox VE 5.2 with a dual AMD EPYC 7601 system first. This system has been running at 50% CPU load for about a week and has not seen an issue. The dual AMD EPYC 7601 platform is currently the top core count and memory capacity dual-socket system that you can use with Proxmox VE. Proxmox’s premium support is licensed by the socket. While the premium support subscriptions are very affordable (about 800 euro per socket per year.) This is an instance where AMD EPYC can save $700-800 per system per year on licensing costs. 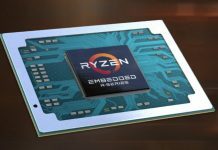 We often focus on closed source software licensing such as VMware during our reviews, but AMD EPYC’s consolidation benefits extend to the open source world as well. This one has VMs running with near 100% CPU utilization and has remained stable. This is the lowest cost 16 core / 32 thread current-generation solution on the market for the platform. Beyond just running VMs we have also tested live migration which is working between these AMD EPYC platforms. 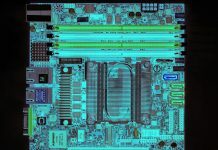 Migration from Xeon to EPYC is still a challenge but otherwise, the servers function like the Intel Xeon systems we have. Proxmox VE is a growing ecosystem that tracks many popular open source projects. Since the solution utilizes newer Linux kernels, we are seeing solid performance from AMD EPYC and a full feature set available for clustering nodes. 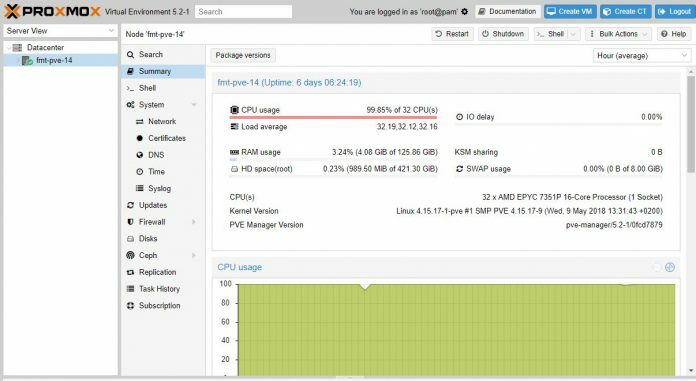 If you want to learn KVM virtualization or build a cluster for storage like Ceph, Proxmox VE and AMD EPYC are working well. 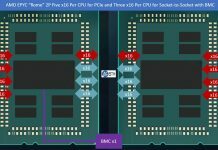 At this point, AMD EPYC represents the largest single and dual socket platforms that can be used with Proxmox VE and the lowest cost per core for Proxmox virtualization. So threadripper will work as well then?